Creosote and Tar – It’s a Fire Hazard! 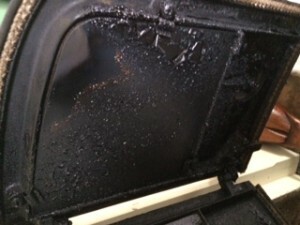 Recently, we’ve seen that several of our customers’ have been affected by the build-up of tar and creosote in their chimneys and stoves over winter – often caused by burning unsuitable fuel – damp or wet wood and not using seasoned or kiln dried logs. In short, if left for too long and tar or creosote builds-up to a greater level, can be a fire hazard. Both are combustible and eventually act as a fuel for a chimney fire and heavy deposits require treatment to remove. So, what causes tar and creosote build-up? Burning wet wood generates steam and gradually this starts sticking to the flue on the way up. We would recommend a moisture meter to check moisture content levels in the wood before burning and aim for a moisture content below 20%. Selecting the wrong wood choice i.e. burning pine fence panels, leylandii or anything that stays green in the winter, can also be a cause of a build-up. These types of wood, hold too much resin in the grain which can over time stick to our stoves, liners and chimney. Another reason for build-up is poor ventilation in the room. -The wood-sap content of the wood being burned. -Moisture content of the wood being burned. -The wood species (or to a smaller degree the type of coal or peat) being burned. -The chimney size, height, location, and construction materials serving the heating appliance. -Anything else that affects chimney draft. -The frequency of chimney cleaning and the thickness of existing creosote deposits. 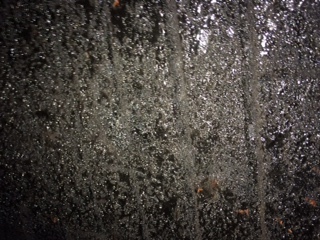 There are 3 stages to creosote and tar build up. Stage 1 – Appears as a light coverage and is brittle and removable by the sweeps brushes. Stage 2 – Appears to be a lot thicker and greater coverage built up – Here we would recommend a cre-away treatment to remove the build-up or at least greatly lessen the amount improve. Stage 3 – Would be a thick, all over coverage that we would be unable to remove with the recommended Cre-away treatment and would only recommend a new flue liner. If left, and still regularly used, a greater level can build up and become more of a problem, potentially resulting in a chimney fire. 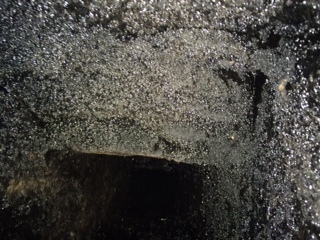 This is why it is so important to have your annual chimney sweep to maintain the safety of your chimney. The Fire Service state that the number 1 way to avoid a chimney fire is by having it cleaned regularly. What are the dangers of a chimney fire? A chimney fire is extremely hot, in some cases reaching over 1,000 degrees Celsius and can melt through even a well-built safe chimney, setting the building on fire. A fire will damage any liner you may have and almost certainly require relining and the high temperature of the chimney fire can damage the bricks of your chimney stack – and in some cases requiring your chimney stack to be rebuilt. How can you tell if you have tar or creosote? 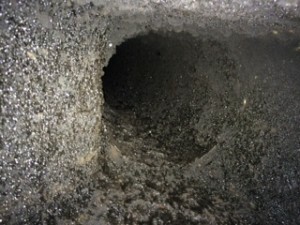 Your chimney sweep, when cleaning your chimney, will be able to identify whether or not tar and creosote is present from what comes down the chimney. What if you’ve already got tar or creosote in your chimney? In the vast majority of cases, we can easily remove it for you. If it is at Stage 1 Level – it can be removed with the sweeps brushes. At Stage 2 – a heavier build-up, requires a chemical powder treatment (Cre-away) which is non-intrusive and typically completed within 1 week. Go from a chimney fire risk to a safe chimney within just 7 days! We would clean your flue and then spray the chemical, which is a powder, up your chimney. Cre-away is a lime powder which we apply with a small compressor attached to a hose and trigger – such as like paint spraying a car. The powder sticks to the tar and creosote and lines the entirety of the flue. We then apply the powder to the flue intermittently, letting the natural draw of the flue taking it as high as possible to give the flue a good coating. Then, over the week, we ask the customer to light a fire (no more than 4 fires within in a week) before we return. The heat from the fire makes the chemical react with the tar and creosote which breaks it down and become brittle. The fires should be nice and hot and burn time should be no more than 2 hours each preferably 1hour 30 mins for best results. After a week, we then return to clean the chimney again and the tar and creosote normally then easily comes off with sweeping brushes – removing a nice pile of grey powder which is the creosote reacting to the powder through heat. This is either fully removed from the flue or 95% removed to a safer level, preventing the flue from being flammable with no risk of a chimney fire. If it is unsafe to light your fire, either because you have a thatched property or your chimney is leaking, then we can provide you with a heater that will have the same affect that a fire would. If you’re worried about the build-up of creosote and tar in your chimney, we’d like to help and resolve any concerns you may have. Don’t risk a chimney fire and the safety of your family! BOOK YOUR ANNUAL CHIMNEY SWEEP NOW. Please just call us on 01223 964305 or email bookings@ablewightchimneyservices.co.uk to book your annual chimney sweep and inspection.